Central Division News: What Makes National Barn Company Central Division Unique? What Makes National Barn Company Central Division Unique? What Makes National Barn Company Unique? Pole Barn Construction in Arkansas, Illinois, Iowa, Kansas, Louisiana, Missouri, Nebraska, Oklahoma, South Dakota, Texas, Wyoming. National Barn Company builds every building with pride. The trusses are set on 4’ or 5' centers, unlike many post-frame builders that set their trusses on 8' or 10' centers in order to cut costs. The trusses are a key element of a building's integrity. The more trusses you have, the better the structural integrity. 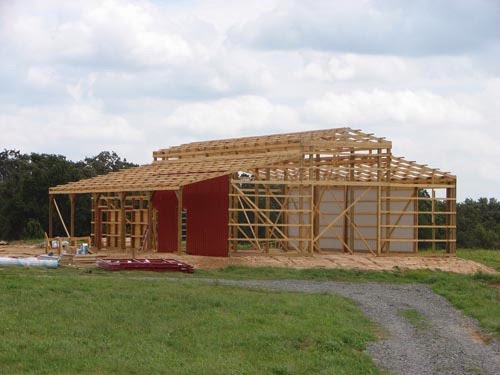 Our trusses are engineered for the location that the building is going to be constructed in. Several other companies will either build their trusses on the job site or they send a standard factory built truss that was never engineered properly. We also run our end posts all the way up to the rafters, rather than stopping at the ceiling joists and using a "dummy" truss. This gives our buildings greater structural integrity, as well as a higher wind load resistance. We NEVER use sheet metal known as “seconds”, which typically does not carry a manufacturer's warranty. We only use #1 Primary American Made Metal, produced by the most reputable metal suppliers in the industry. We use solid sawn posts that are fully treated, unlike other companies that will only use treated lumber in the ground and untreated lumber above the ground. These posts typically consist of 2x6s that are glued or nailed together; therefore the strength is only as good as the glue or the nails. We set our posts 3' (minimum) into the ground for a more solid footing and to ensure that the post is below the frost line.